Carboy Carrying Web Strap, 2 people can carry! Adjustable. Black for 5-7 gallon jug shown. One of our winemakers said these are the best thing since sliced wine. They allow him to carry the jug alone with 2 hands and a better center of gravity. 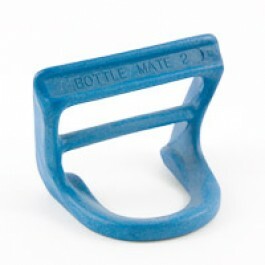 Handle PET Better Bottle can be removed and used on another jug. Just have a special place to hang it when not in use. 5 gallon and a 6-7 gallon size. We really like to see you with a hand on the bottle of your jug, rather than assuming that the neck of the carboy will support the weight of the juice, wine and jug, which is anywhere from 50-70 pounds or so. To prevent the unit from slipping off the carboy neck... Remove the wing nut, washer and bolt. Cut the plastic on the handle so you can spread the prongs apart. Spread the prongs apart. Insert the prongs of the circular neck piece, so that they alternate with the handle prongs. Reinsert the bolt and tighten the wing nut firmly with finger power. IF the bottle is smaller necked than our 5 or 3 gallon carboys, spread the handle prongs apart enough so that the prongs of the neck piece fit totally inside the handle prongs. Reinsert the bolt and tighten.